James K. Irish is currently a freelance writer who has worked for newspapers since 1980. His primary emphasis over the years has been sports journalism, but he also has a passion for profiling individuals with inspiring and compelling narratives. His writing has appeared in Runner’s World, Running Times, Trail Runner, and Marathon & Beyond. James graduated from Manhattan College in Bronx, New York with a BA degree in English Literature in 1974. This article appeared in Northwest Evans Living. 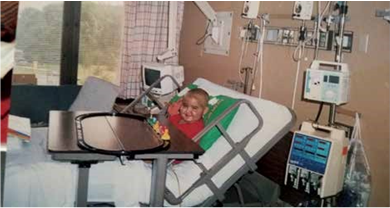 Complaining of stomach pain, three-year-old Andrew Rogers was diagnosed with appendicitis and had routine surgery close to Thanksgiving of 1999. Jim Sherman, the surgeon at University Hospital who removed the appendix, said he saw a shadow when he examined the X-ray. A blood test concluded that Andrew had a malignant tumor on his liver. Andrew was transferred to the Medical College of Georgia, where surgeon Charles Howell, told the Rogers that he had dealt with only six cases of liver tumors in his 20 years of practice. “With all due respect, I want someone who does this every day,” Linda said at the time. Howell recommended one of his former residents, Adela Casas, who had gained considerable experience performing liver surgery at St. Christopher’s Hospital for Children in Philadelphia. The Rogers spoke with Casas by phone. “Her confidence won us over,” Linda says. Shortly after, the Rogers flew to Philadelphia, arriving on a Monday. By Wednesday, Andrew was in surgery. “That’s when we had the first blow,” Linda says. The tumor was too large to remove. Staff recommended returning to Augusta for chemotherapy to shrink the tumor before removing it. After four rounds of chemotherapy, Andrew and his parents returned to St. Christopher’s. The tumor had not shrunk enough. The only option was a transplant. The family was tested to find a match. Linda’s blood type matched, but the staff informed her that her liver was too small. “There’s nothing small about me, but my liver,” Linda jokes. Rodney was just as disturbed by the pronouncement. “Where I was raised, you never give up,” he told the doctor. After researching his options, Halligan returned a few days later. “We’ll go outside the box, not the routine, standard treatment,” he said. What he decided was to put a catheter in Andrew’s stomach and inject chemo into it. After the chemo was injected into the stomach, a pathologist told them that 90 percent of the cancer cells were dead and the other 10 percent were dying. But a few days later, they received devastating news. The chemo had destroyed the new liver. Andrew was rushed to ICU requiring another liver. He had 48 hours to live. Linda asked if her liver could be used. “It’s too small; we’ll have complications,” Casas said. Andrew was on a transplant list, but if one wasn’t available by the next morning, Casas agreed to use Linda’s. Morning arrived with none available. Andrew and Linda went into surgery. When Andrew’s liver was removed, it was so damaged that it “fell through the surgeon’s fingers like jelly,” Linda said. To make matters worse, surgeons couldn’t stop the bleeding during the transplant. Steve Dunn, chief of surgery, asked the team to step back and say a prayer. They paused. The bleeding stopped, and they continued on, using a split transplant from Linda. Andrew remained in surgery for 15 hours and needed 26 units of blood. After recovery, Andrew was transferred to A.I. DuPont Hospital for Children in Wilmington, Delaware, where members of the same transplant team from St. Christopher’s were now working. Andrew spent 3 1/2 months at A.I. DuPont. During that time, Linda and Rodney stayed at a new Ronald McDonald House next to the hospital. Before being released from A.I. DuPont, Andrew also had part of his colon removed and stents placed in his liver. He returned every three months to Philadelphia for follow-up visits. Then in 2002, a CAT scan revealed that he had numerous tumors in his lungs. Halligan struggled to find a surgeon who would operate. Richard Ricketts at Emory University in Atlanta agreed to “berry pick” the tumors but only once. Later, he reversed his initial statement, eventually performing four surgeries to remove tumors from Andrew’s lungs. Andrew has not had surgery since Oct. 21, 2005. Through 46 surgeries, the Rogers say they learned to lean on God’s strength because theirs wasn’t sufficient. During one round of chemo in Philadelphia, Rodney left the hospital to buy lunch for Andrew. In the multi-level parking garage, he found a business card on their car windshield with only Matthew 21:22 written on it. (“If you believe, you will receive whatever you ask for in prayer.”) Thinking it was a church group, he checked the other parking levels to see if someone was placing the business cards but never saw anyone. He saw no cards on other cars. “That was the problem I was struggling with: having real faith,” Rodney says. Almost 10 years later, Andrew, 19, remains cancer free. He will graduate with a 3.7 GPA in May from Greenbrier High School. He plans to attend GRU and earn a science degree. After shadowing the radiation oncologist for a week, Andrew wants to become a medical physicist. “I have a strong desire to help others in the same position I was in,” he says. Because of septic shock before the second transplant, Andrew was bombarded with antibiotics, which destroyed his inner ear. As a result, he has a profound hearing loss. He wears hearing aids and is learning sign language. He also has 75 percent lung capacity because of scarring from surgery but plays basketball with his friends and runs. The Rogers remain in touch with many of the medical staff who worked with Andrew. Two months ago, they drove to Philadelphia to see Halligan and other staff at St. Christopher’s. “This is my miracle boy,” Linda says with gratitude. 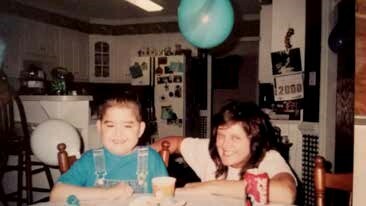 Andrew at welcome home party in 2000 with his aunt, Brenda Waldrop, the liver transplant donor.